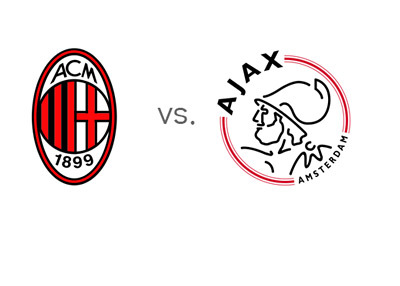 AC Milan will host Ajax in the last round of games in Group H of the UEFA Champions League on Wednesday, December 11th, 2013. This is a huge game. The winner will progress to the knockout stage of the competition, while the losing side will continue their journey in the UEFA Europa League. In case of a draw, AC Milan will advance as they are one point ahead of Ajax at the moment. AC Milan are a struggling side this season. They are in ninth place in Serie A after fifteen rounds, twenty two points behind first place Juventus. In their last match, they drew 3-3 vs. eighteenth place Livorno. AC Milan did show signs of life in their last UCL match vs. Celtic, in Glasgow, where they won with the score of 0-3. Ajax are in second place in Dutch Eredivisie after sixteen games played, two points behind Vitesse. They are currently on a six game winning streak having won the last four domestic league matches and their last two UCL games. Ajax most recently beat ADO Den Haag and NAC Breda, both with the score of 4-0 domestically, while in the UCL they beat Celtic 1-0 and Barcelona 2-1. When Ajax hosted AC Milan on October 1st, the final score was 1-1. Let's take a look at the odds for the upcoming match at San Siro. AC Milan are the favourites to win at home. A 100 € bet on Kaka & Co. could return 66 € in profit, while the same bet on Ajax could return 500 € in profit. The most likely scorelines, according to the odds, are a 1-0 victory for the hosts and a 1-1 draw, both offered at 6/1. El Shaarawy (11/10), Balotelli (6/5) and Kaka (13/8) are the favourites to score for Milan. Kolbeinn Sigthorsson, the Icelandic striker, is the favourite to score for Ajax at 5/2. Can AC Milan find the way to deliver on Wednesday, or will the in-form Ajax be strong enough to surprise and beat the odds?